To make the cupcakes, preheat oven to 160°C (325°F). Place the flour, cocoa, sugar, butter, eggs, milk and vanilla in the bowl of an electric mixer and beat on medium speed for 6 minutes or until pale and smooth. Spoon the mixture into 12 x ½-cup-capacity (125ml) cupcake tins lined with paper cases. Bake for 22–25 minutes or until cooked when tested with a skewer. Transfer to a wire rack to cool completely. To make the vanilla butter icing, place 250g softened unsalted butter in the bowl of an electric mixer and beat for 6–8 minutes or until pale and creamy. Scrape down the sides of the bowl, add 2 cups (320g) sifted pure icing (confectioner’s) sugar and 1 teaspoon vanilla extract and beat for a further 10–15 minutes or until light and fluffy. 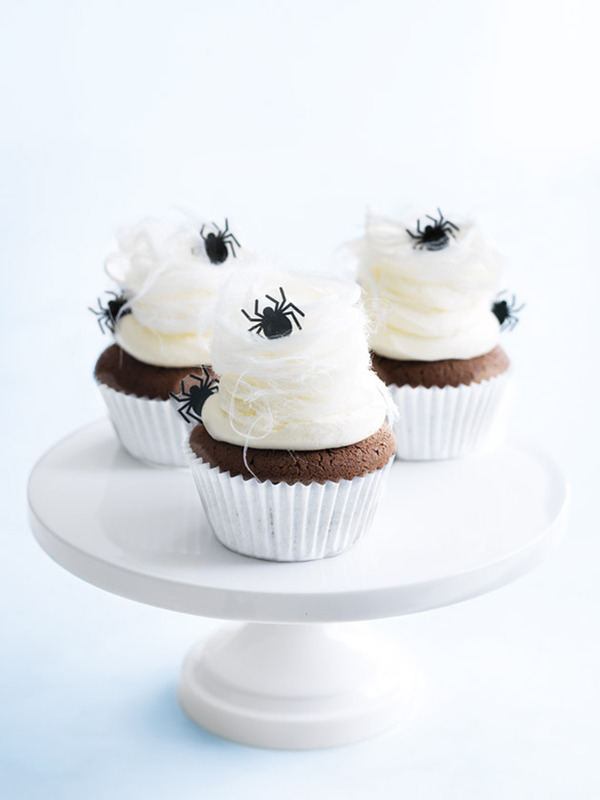 To decorate, place the icing into a piping bag fitted with a 1cm round nozzle. Pipe icing onto each cupcake. Top with the fairy floss and plastic spiders. Makes 12. Tip: Be sure to remove the plastic spiders before serving.